It’s here and we’re excited to tell you about a new product…….. The PICKUP TUCK, A Trunk for your Pickup Truck Bed. PICKUP TUCK IS A Portable Cargo Space Organizer. It’s designed to easily convert a pickup truck bed into personal cargo space on demand. It acts as a Trunk for your Truck. A Portable Cargo Space Organizer it has been designed to fit Ford, General Motors and Chrysler pickup trucks. TSP Enterprises are the inventors of the PICKUP TUCK, a blow molded, patent-pending aftermarket accessory for pickup trucks. The PICKUP TUCK is designed to convert the rear 1/3 of a pickup truck bed to secure, easy to reach cargo space for work, play, and everyday use. PICKUP TUCK was the brainchild of James Todd, one of the founders of TSP Enterprises who raises horses in Marshall, MI. James, an avid horse owner was always hauling hay, horse gear, and personal items. That meant constantly, rearranging, loading and unloading his truck bed. He needed a solution that gave him more utility and flexibility for his pickup truck bed. His solution was to develop a personal cargo organizer for the truck bed a “trunk for his truck. James, a journeyman toolmaker, crafted the first PICKUP TUCK prototype from wood clad with polyethylene plastic in his workshop. As James and his family attended various horse shows, they encountered a significant level of enthusiasm for his “Trunk for your Truck”. The interest was so significant that he was compelled to make several one-offs, of the trunk for his friends which has led to TSP Enterprises and the PICKUP TUCK. The competitive landscape for personal cargo organizers has not been adequately met. The truck market demands low price, portability, ease, and flexibility of setup and utility for everyday use. PRICE – PICKUP TUCK is priced at $375 versus Tonneau Covers / permanently installed toolboxes and storage products at $400 to $1,700. DURABLE – made of High-Density Polyethylene. PORTABLE & LIGHTWEIGHT – PICKUP TUCK weighs 25.5 lbs., and setup does not require tools. It can be set up or stored in less than 5 mins. It folds away for easy storage in the truck cab or garage when not in use. ACCESSIBILITY & SECURITY – PICKUP TUCK offers access to cargo from the tailgate. It provides weather protection for stored items. Cargo can only be accessed from an unlocked and lowered truck bed tailgate. The journey to go from PICKUP TUCK, as a product concept to design, engineering and production have been filled with many challenges for TSP. But thanks to buy-in from a team of committed early supporters, the PICKUP TUCK journey is at the finish line. Early validation for TSP and PICKUP TUCK was received when the PICKUP TUCK product concept was presented to Automation Alley. Automation Alley is a business incubator funded with grants from Michigan Economic Development Corporation (MEDC) and a variety of other sources. Automation Alley has played a vital role in helping TSP with business planning, corporate structure and governance and raising capital. They were convinced PICKUP TUCK could be a successful product and help secure an equity investment in TSP to help fund the product. They were instrumental in helping to secure two rounds of funding through the Small Business Development Corporation of Michigan (SBDC). SPI Blow Molding, LLC has become an integral part of the TSP team. As an industry leading, ISO-9000-2015 Certified custom blow molder SPI is continually recognized for delivering high quality, innovative production solutions where others have fallen short. Based in Coloma, Michigan and along with its sister company, (SPI Industries) in South Bend, IN, there are few custom blow molded or injection molded projects SPI companies cannot handle. SPI has experience in supporting the development and manufacturing of many industrial products, some are available in our web store. Leadership at SPI recognized the value of the PICKUP TUCK product to consumers. After meeting the dynamic team at TSP, SPI Blow Molding became an equity partner with TSP to facilitate product and tooling design support for ease of manufacturing. SPI will produce all plastic components and provide the final assembly for the PICKUP TUCK. We are proud to be associated with such a strong and committed team to deliver the PICKUP TUCK to our customers On Time and at a Fair Price. 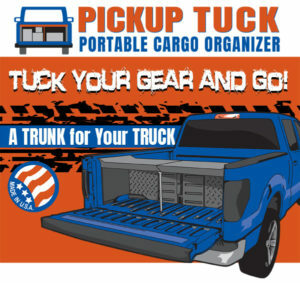 Go to the Pickup Tuck website to learn more about the PICKUP TUCK Story. TSP Enterprises plans to launch a crowdfunding campaign through KICKSTARTER. Leave your email information and get more information on becoming a Backer and getting PICKUP TUCK accessories, discounts, and more.